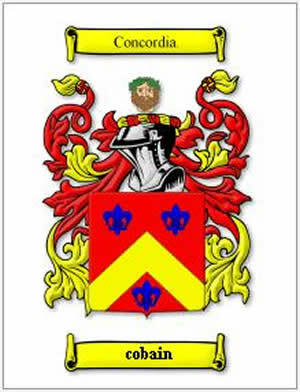 In addition to the possibility that the Cobain surname is of French Huguenot origin, there is also evidence to support a Gaelic connection. In 1831, James Logan wrote “The Scottish Gaël; Or, Celtic Manners, as Preserved Among the Highlanders: Being an Historical and Descriptive Account of the Inhabitants, Antiquities, and National Peculiarities of Scotland: More Particularly of the Northern, Or Gäelic Parts of the Country, where the Singular Habits of the Aboriginal Celts are Most Tenaciously Retained, Volume 1"
“The Scottish Gaël; Or, Celtic Manners, as Preserved Among the Highlanders: Being an Historical and Descriptive Account of the Inhabitants, Antiquities, and National Peculiarities of Scotland: More Particularly of the Northern, Or Gäelic Parts of the Country, where the Singular Habits of the Aboriginal Celts are Most Tenaciously Retained, Volume 1" by James Logan, Smith, Elder And Co. 1831. Where did the English Cobain family come from? What is the English coat of arms/family crest? When did the Cobain family first arrive in the United States? Where did the various branches of the family go? What is the history of the family name? Until quite recently, the English language has lacked a definite system of spelling rules. Consequently, Anglo-Saxon surnames are characterized by a multitude of spelling variations. Changes in Anglo-Saxon names were influenced by the evolution of the English language, as it incorporated elements of French, Latin, and other languages. Although Medieval scribes and church officials recorded names as they sounded, so it is common to find one person referred to by several different spellings of his surname, even the most literate people varied the spelling of their own names. Variations of the name cobain include Cobham, Cobbam, Cobban and others. First found in Kent where they were seated from very ancient times, some say well before the Norman Conquest and the arrival of Duke William at Hastings in 1066 A.D.
Searching for a better life, many English families migrated to British colonies. Unfortunately, the majority of them travelled under extremely harsh conditions: overcrowding on the ships caused the majority of the immigrants to arrive diseased, famished, and destitute from the long journey across the ocean. For those families that arrived safely, modest prosperity was attainable, and many went on to make invaluable contributions to the development of the cultures of the new colonies. Research into the origins of individual families in North America revealed records of the immigration of a number of people bearing the name cobain or a variant listed above: Mary Cobham who settled in the Barbados with servants in 1680; Robert Cobham settled in Philadelphia in 1774; Thomas Cobham settled in New Hampshire in 1718.